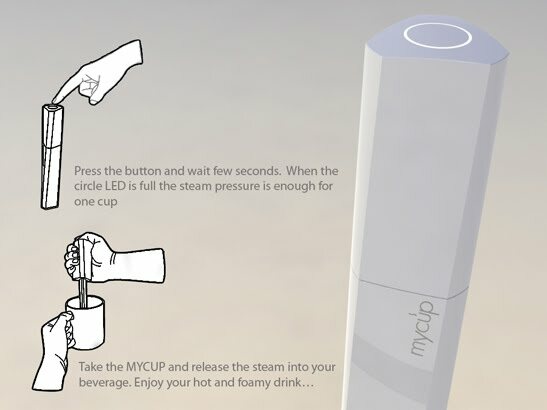 MyCup is a compact beverage steamer. With MyCup you can easily heat up and foam a cup of milk for a cappuccino, Cafè latte or a shoko within a seconds. The docking station is actually a water container with a heating body and the upper part is the steam chamber. After pressing the button the water start to heat up and the steam goes up through the valve. When there is enough pressure in the chamber you can take the upper part and release the steam into your beverage. In addition, there is an option to install a flavor capsule at the head of the nozzle and release the steam through it. This way you can get dozens of beverages options.